Hi friends! Some people say Young Adult fiction is just for girls (hence the previous Marry, Date or Dump: YA Lady Authors post). I disagree. There are plenty of books for teenage boys to enjoy, just as there are plenty of YA books written by male authors. What’s more boys can like books written by female authors and girls can like books written by male authors. Here are three of my favorite male Young Adult authors for you to marry, date or dump in the comments. Enjoy! John Green: Author of Looking for Alaska, An Abundance of Katherines, Paper Towns, and The Fault in Our Stars. Makes great youtube videos with his brother and other collaborators. Here he explains to a 15 year-old girl how to make boys like her. It is adorable. Marcus Zusak: Author of The Underdog, Fighting Ruben Wolfe, When Dogs Cry, The Messenger, and The Book Thief. Owner of a fantastic Australian accent. Ransom Riggs: author of The Sherlock Holmes Handbook, Miss Peregrine’s Home for Peculiar Children, and Taking Pictures. This video is kind of lame because I wanted to get one where you could see his face and hear his voice, but Ransom actually has great youtube channel along with a great name. This entry was posted in Marry Date or Dump and tagged books, John Green, Markus Zusak, Ransom Riggs, YA Fiction by Alison Doherty. Bookmark the permalink. Oh gosh, marry John Green in a heartbeat. Date Markus Zusak AND Ransom Riggs. For many passionate years. Till John Green came along. 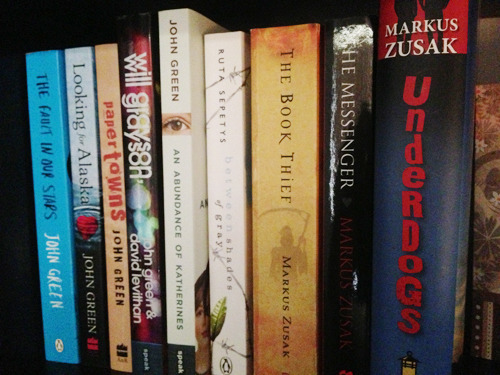 I would marry John Green and Markus Zusak tomorrow if I could. I’d date Ransom Riggs.